I love getting dressed up. I love it, I love it, I love it. Did I say I love it? If I could go to fancy parties every weekend I wouldn’t complain. This summer is the first summer in a while that we haven’t had a mad mess of weddings to attend and it makes me a smidge sad. I know, I’m probably weird, but it’s true. My beautiful cousin Julia got married this weekend and it was wonderful! I behaved myself and didn’t buy a new dress, but I did buy a new necklace during one of the recent J.Crew 30% off promos- the Crystal Floral Statement Necklace. This necklace is gorgeous and truly a statement piece. I decided to make this the focal point of my outfit, pairing it with the bright pink Lucille dress from last summer and the Everly mirror pumps (which I think I’m up to wearing 3x a week I love them so much!) My only complaint about this dress is that it isn’t cinched in at the waist as much as I’d like, but that’s easily remedied with a skinny belt. 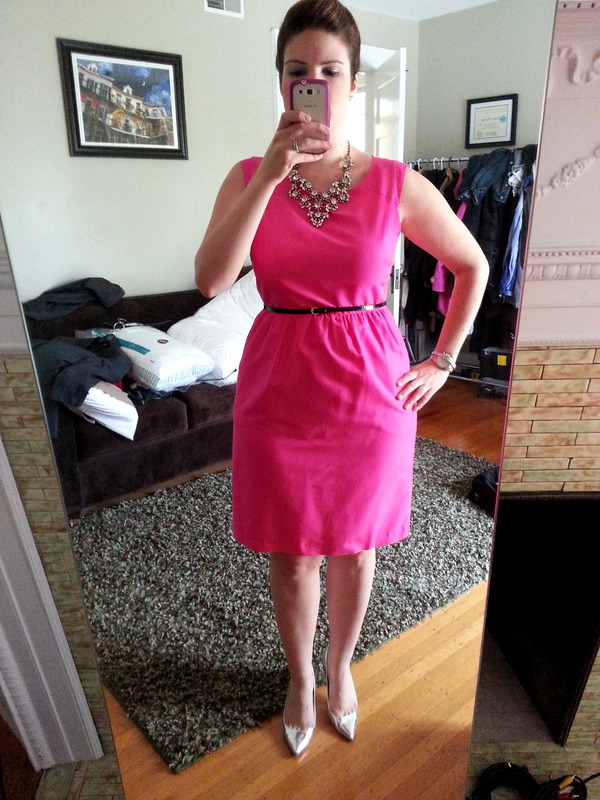 The bright color of this dress isn’t for everyone, but as you know, I love me some hot pink. I recently had the hem let out on the dress so it’s not quite so short anymore and I couldn’t be more happy with it. . So, what do you think? Wedding fab or what? Would love to hear what you think and thanks for visiting! What a great statement piece! It totally works with those killer heels.